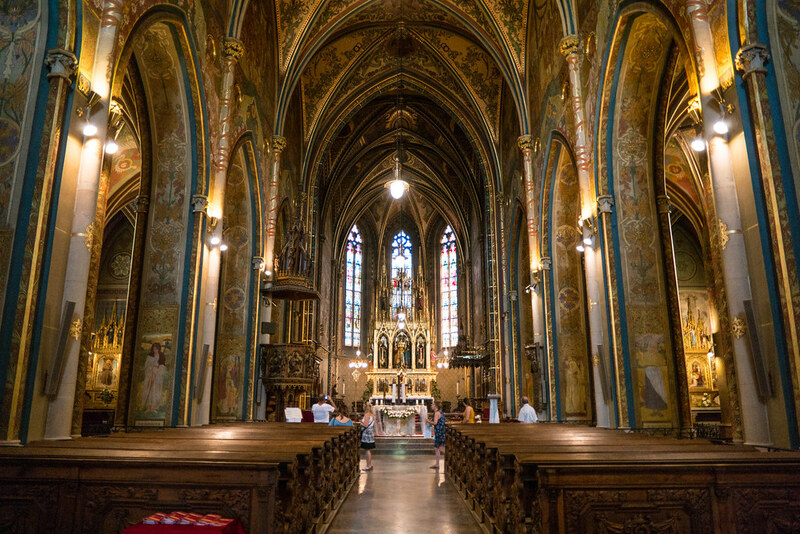 The Basilica of St. Peter and St. Paul in Prague often makes the top ten list of the "Best Churches in Prague" but rarely make the "Must See Attractions" list. And yet it is by far, one of the most impressive pieces of ecclesiastical Slavic Art Nouveau Architecture in the city. 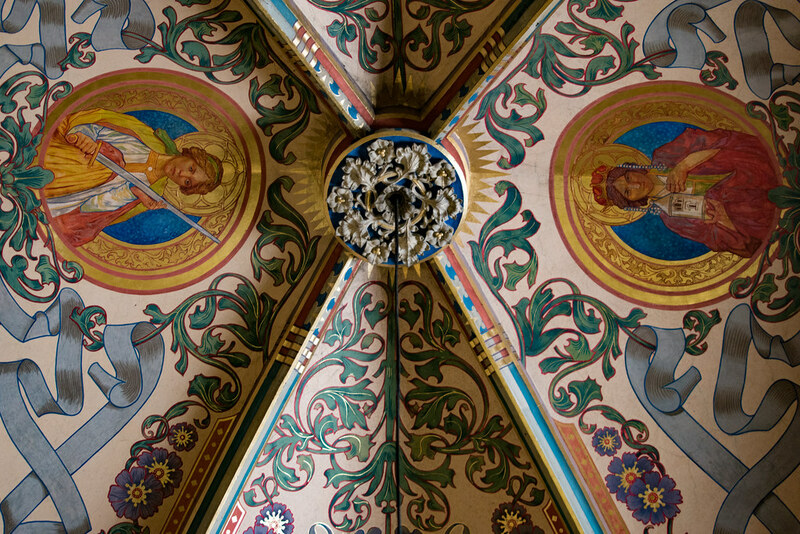 It also serves as a kind of history lesson about the Slavic people, Czech history and even art itself. 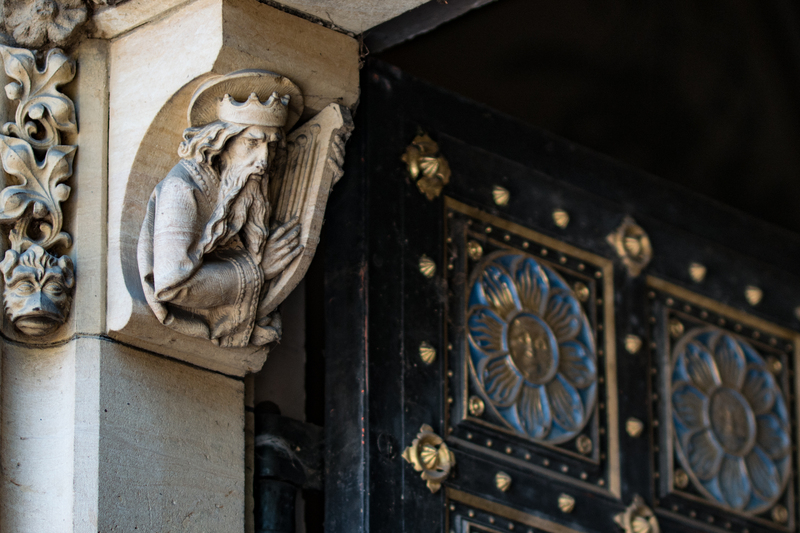 Although the church doesn’t have the lofty status of "St. Vitus" or the draw that "St. Nicholas’ Church" gets, if you make an effort to come down and visit, you’ll see what the rest of those unknowing tourists are missing out on. 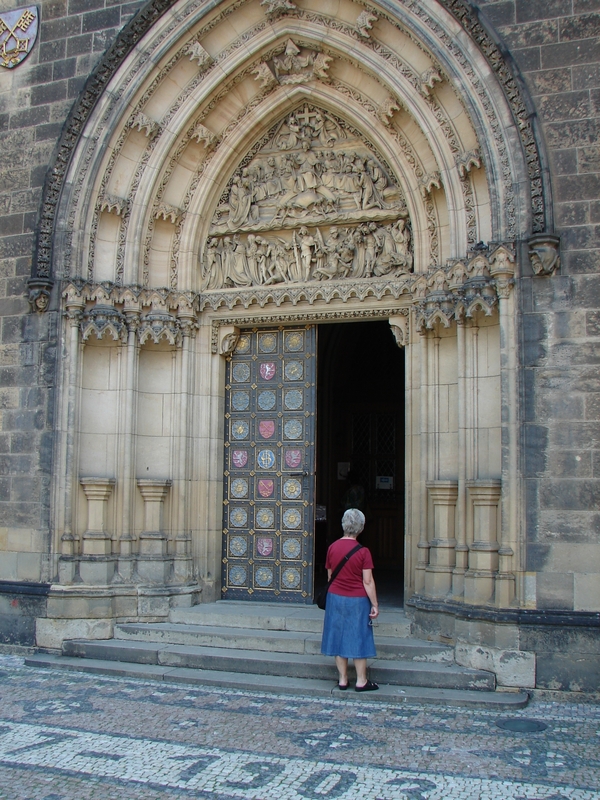 The church was founded in 1070 by the Czech King Vratislav II. Originally, it was a beautiful Romanesque Basilica, but in 1249 it was destroyed by a great fire, like so many of the original Basilica's were. The first reconstruction was a rather meagre endeavour, so in 1885 a new renovation was commissioned to build a more elaborate, neo-gothic church. Master builder Joseph Mocker was the original architect, but he died halfway through construction. His partner František Mikš finished the design and oversaw the rest of the building. But Mikš made a few changes to the initial layout, mainly the addition of the towering facade. Let your eyes float up to the tops of the church's twin towers. If you take a closer look and you might notice that the spires are hollow. Their design was influenced by the cone-like formations of the chestnut flowers which bloom behind the church in Vyšehrad cemetery. Decorating the outer edges of the spires and the triangular gable are frilled, pedal like protrusions which \resemble the natural forms of a flower. 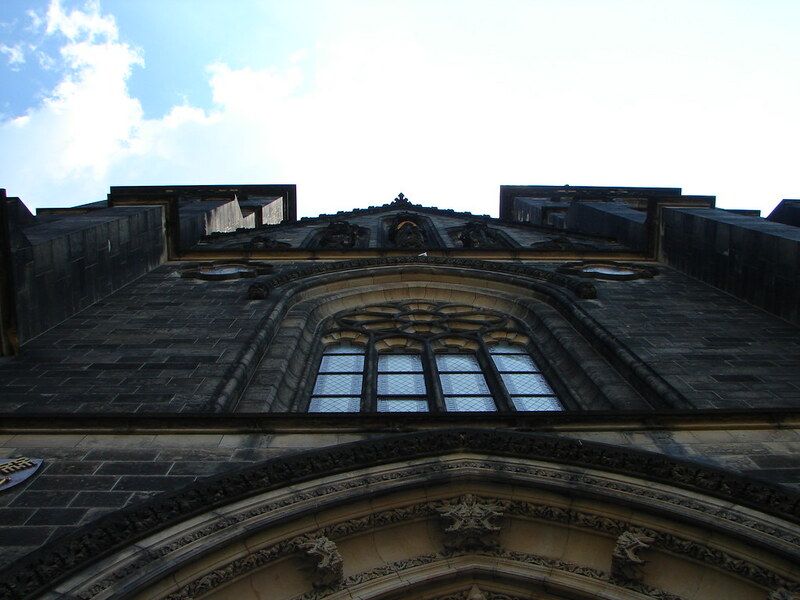 The facade features three vestibules, two towers, and a crowning triangular roof. 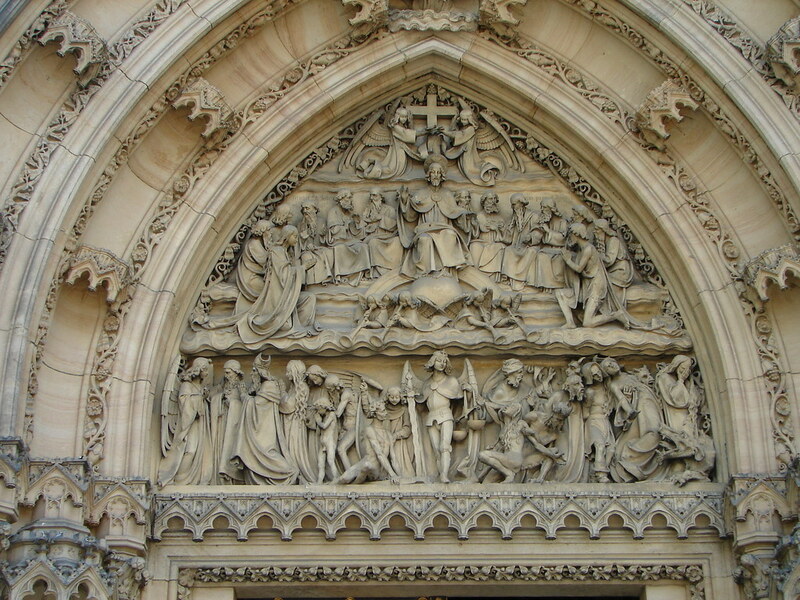 Above the central entrance, is the tympanum, decorated with the scene of Jesus standing tall beside his apostles. Saint Michael sits below Jesus, ushering people into heaven accompanied by a chorus of angels. As you step into the church, the first thing you'll be struck with is the abundance of gold used throughout. 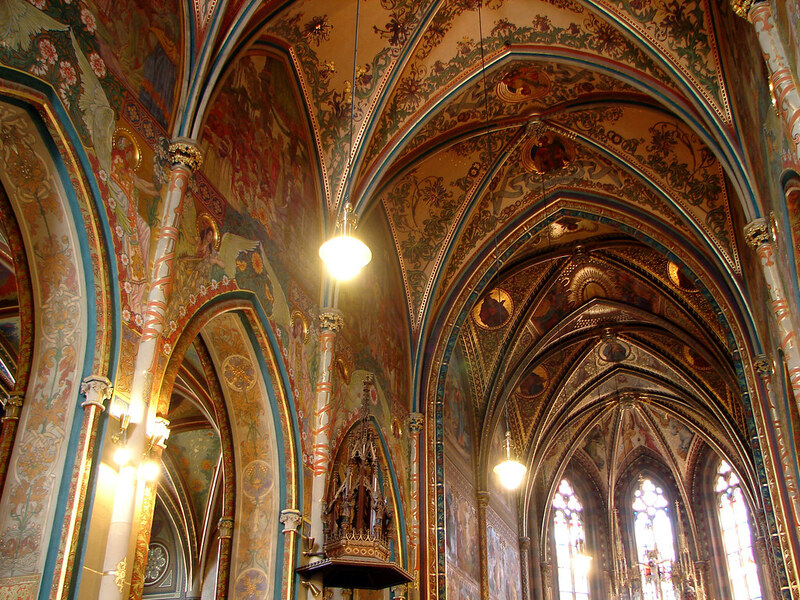 The walls and ceiling almost look like an intricately embroidered gown. Floral trimmings cover every inch of the building, giving you the feeling of walking into a golden forest. The church is comprised of one wide nave, two side aisles, a large choir, a sanctuary and an apse. The sacristy and the chapel for Panna Maria Šancovská, "Our Lady of the Ramparts" is split off from each of the side aisles, making it a private portion of the building. 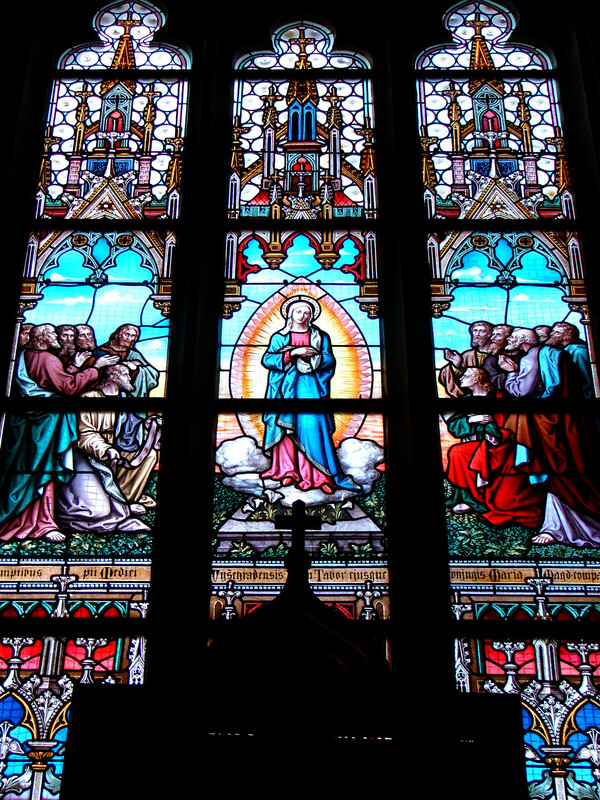 Brightly coloured stained glass enhances the outer walls of the Basilica. Each window depicts a scene from the bible set inside iconic elements from architecture. 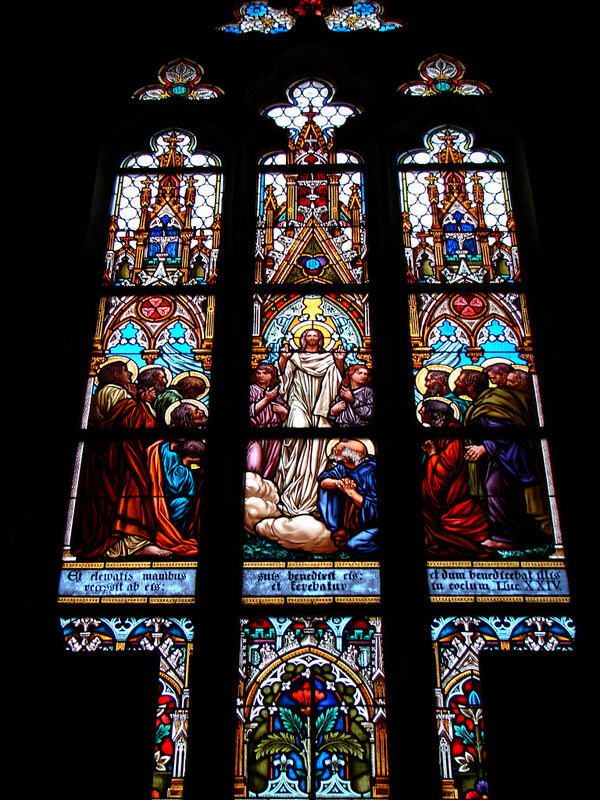 Renaissance tracery windows, gothic quatrefoils and baroque altar pieces all serve as the framing around these dramatic pictures. 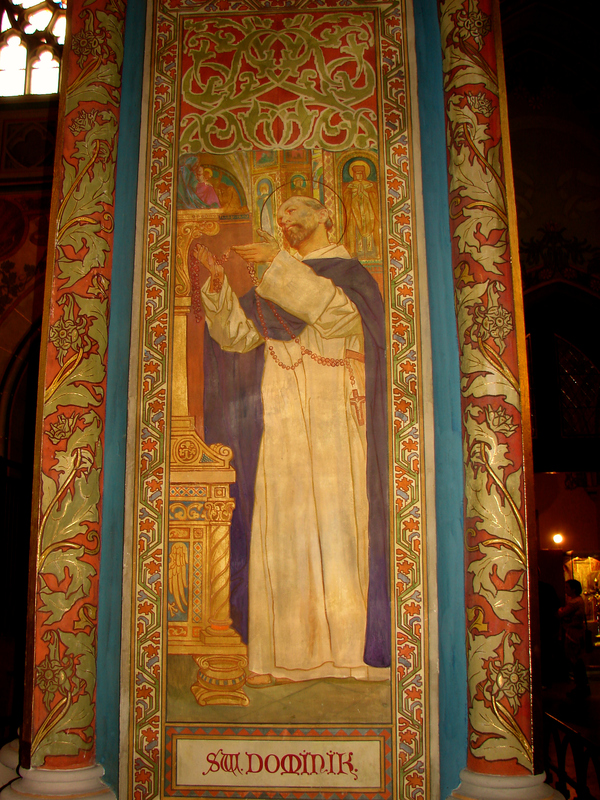 But the most extraordinary characteristic of the basilica is the gilded frescos which beautify the entirety of the basilica. 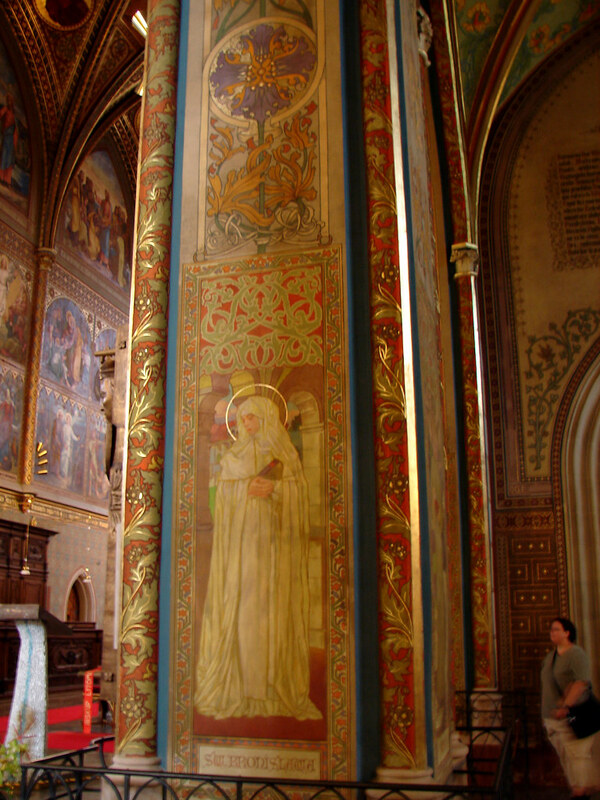 These paintings are decorated with ornate flowing images by painter František Urban and his wife, Marie Urbanová-Zahradnická. Although they look like paintings done by famous Czech painter Alphonse Mucha, they are only inspired by his quintessential Art Nouveau style. 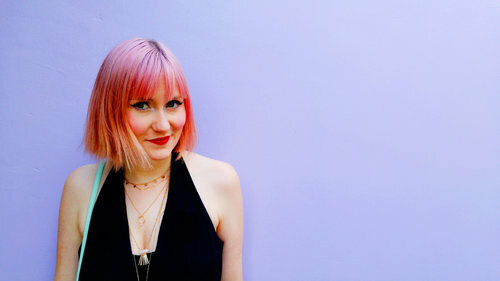 Women, and men, with delicate features and flowing hair embellish the walls and archways. Running up every pillar are blooming patterns and colourful ribbons. The walls contain lots of vivid greens and deep brown hues, continuing the woodland theme. Even the dark church benches were carved into oak leaves, bringing the outdoors inside. 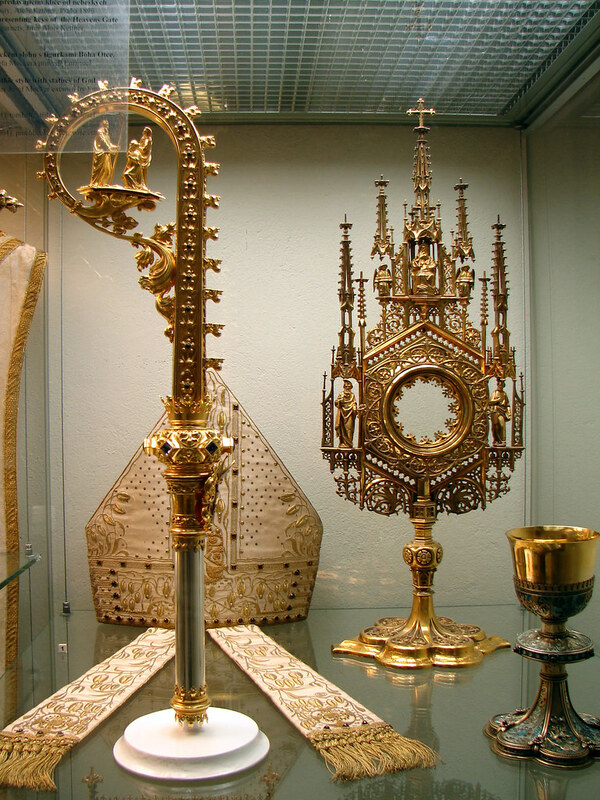 The Treasure Room inside the church contains all different precious ecclesiastical Czech objects. 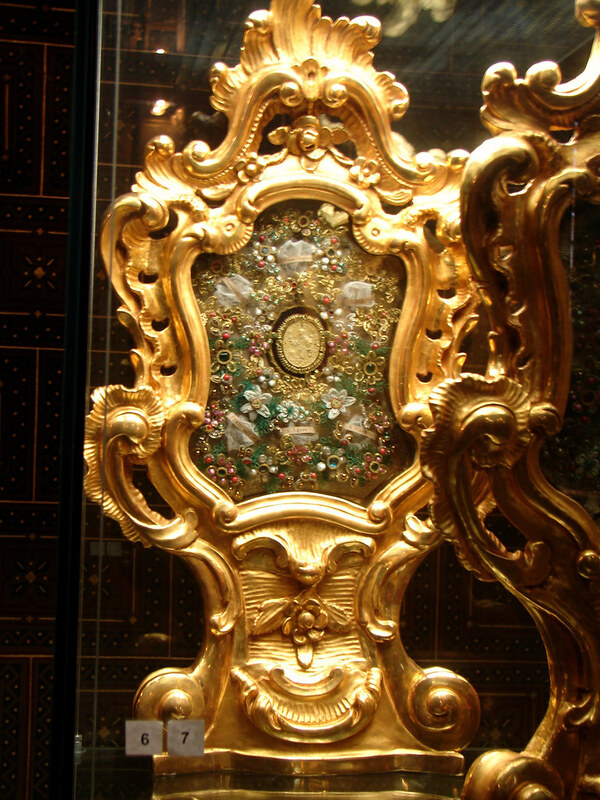 Baroque illustrated manuscripts, golden chalices and gem covered books hid behind protective glass. Set behind the church is the Vyšehrad Cemetery. 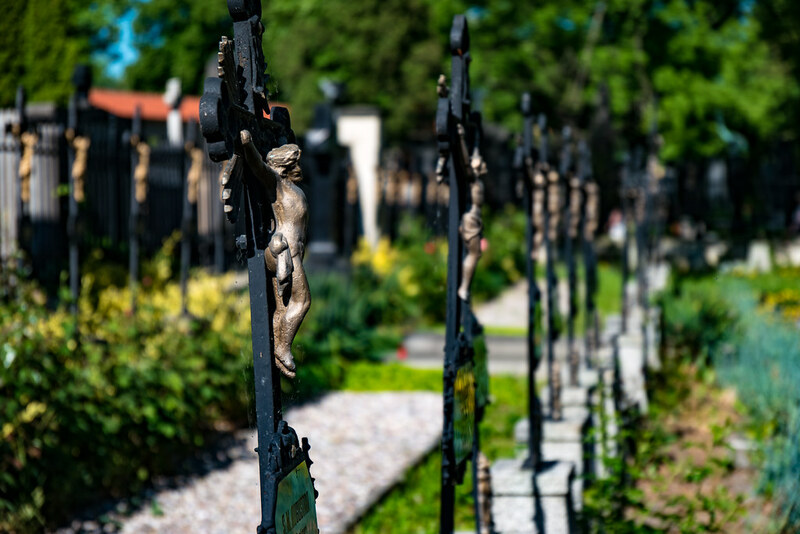 Built in 1869, the cemetery was created as a resting place for some of Prague's most treasured creatives. Here lies dozens of composers, artists, sculptors, writers, and those from the world of science and politics. 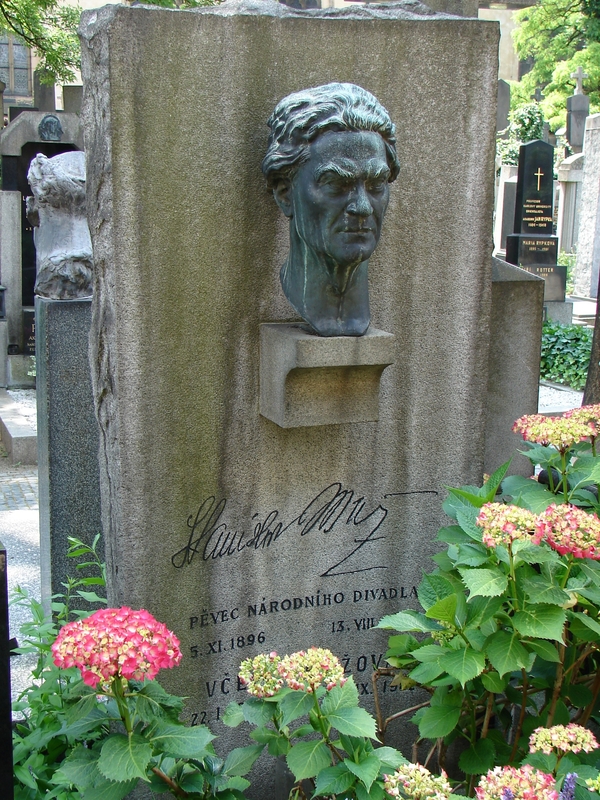 Alphonse Mucha, king of Czech Art Nouveau, was buried here in 1939 along with; composer Antonín Dvořák, Art Nouveau sculptor Ladislav Šaloun, author Karel Čapek and many more. 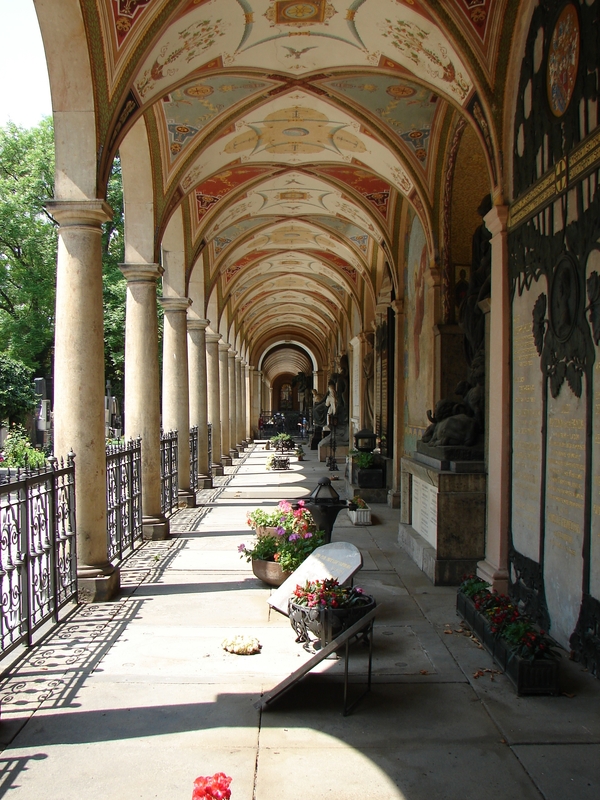 The most majestic part of the cemetery is the Slavín Tomb designed by Antonín Wiehl. The Slavín Tombs are considered a 'pantheon', "a building in which the illustrious dead of a nation are buried or honoured". 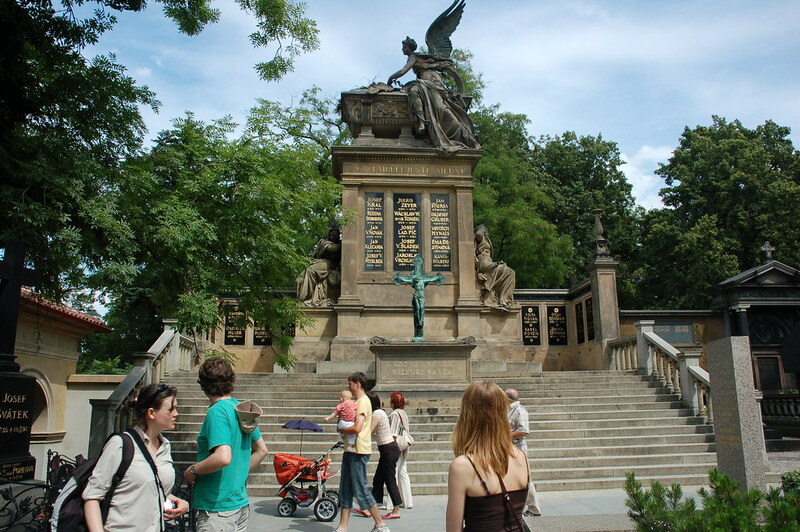 The dramatic sculpture atop the tombs were carved by Josef Mauder. The pantheon contains 44 burial tombs, as well as various coffins and urns. 55 people in total were buried here under the magnanimous sculptures of "Mourning" and "Victory" represented as two alluring women.